Every year for halloween I bake a "scary" gingerbread house. 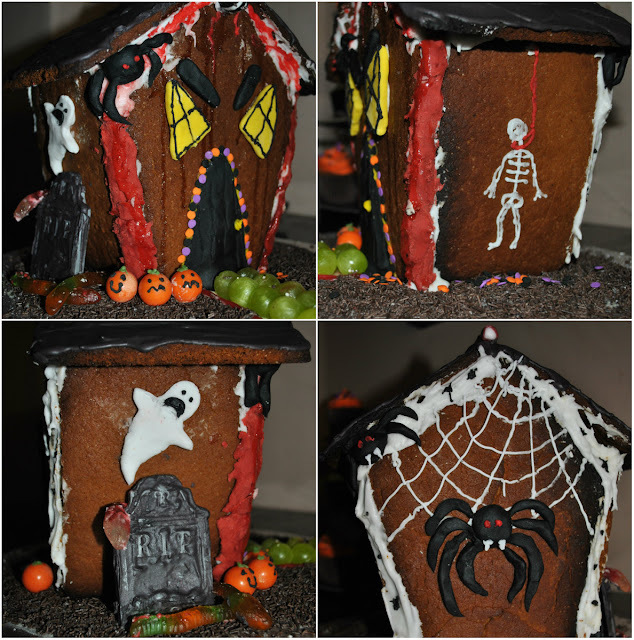 I know that gingerbread makes people think of Christmas, but it is SO MUCH fun making a haunted house you can eat. If you are having a party this is a great centrepiece & goes really well with a halloween spread. To start, heat your oven to 180 degrees. Now get your butter, sugar and syrup in a pan and melt them all together. This is really fun to do, but obviously be careful as it is super hot! Mix your dry ingredients (the flour, bicarbonate of soda & ginger) in a large bowl, then stir in the buttery sugar mixture to make a dough. It'll quickly get stiff, so use your hands to knead the dough & add a splash of water if things aren't mixing together too easily. Now roll the dough out on baking paper to just under 1cm thick. You can download a template to cut out, or draw your own. I tend to just draw my own on plain paper & use this to cut out the shape of a house (and cut the leftover dough into gravestones). 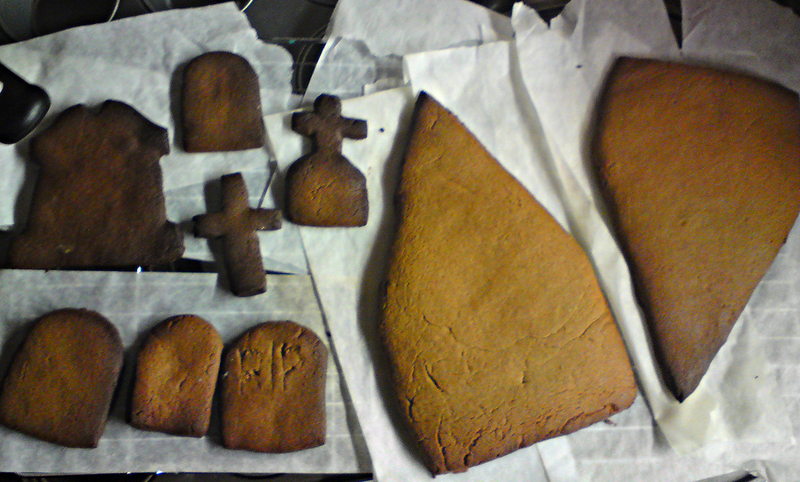 Very carefully move the gingerbread shapes onto a baking sheet (move them on the paper) and bake for about 12 - 15 minutes. If you roll it too thin it'll burn, so be careful! Once baked, move (carefully!) to a wire rack to cool and leave it to harden. Once it's cooled, make up your royal icing (I just use a packet from Sainsburys) and make sure it is THICK. This is your gingerbread house cement. 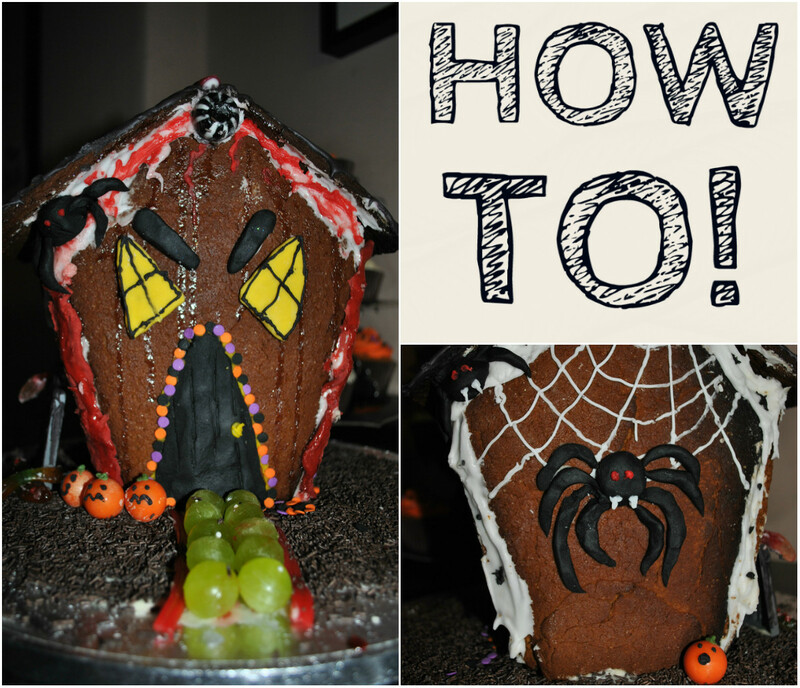 Get a helper to hold things for you, and start to join the walls together with icing. Prop the walls up with cans and leave to dry. Then (hours later) use more icing to put on the roof panels. I tend to wedge books underneath the roof so it has support while it dries. Leave for AGES (overnight at least) to let your icing set properly before you start decorating. Now the most fun bit! Go wild with sweets & make shapes out of icing to decorate your house. Last year I went for giant spiders, ghosts, orange gobstoppers with faces piped on to make pumpkins, & jelly snakes. I covered the roof with a dark purple icing & drizzled red food colouring down the front to look like blood. Love this! :) Such a good idea to make one for Halloween, I want to make one for Christmas this year because I've never made one, but might have to do this first to test it out :P.
Ahh! That's such an awesome idea! Never would've thought to make one for Halloween, though I think I like it better! I've never made a gingerbread house period, so I think I'd be most worried about it falling apart, haha. Thanks! The key to keeping it together is making sure you've got thick royal icing and leave it to set for as long as possible! The only time I've had problems is when I've been impatient & tried to decorate too quickly. Oh, wow! What a great idea! I love gingerbread so might have to give this a go. Sure my housemates will be pleased if I do! I love it. So much work went into that house. The face is uber creepy. 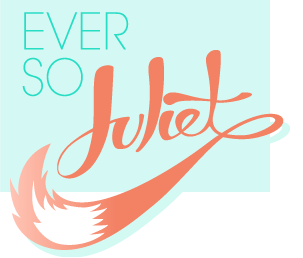 Amazing Juliet! This looks fab (and yummy too - got to love gingerbread! ).